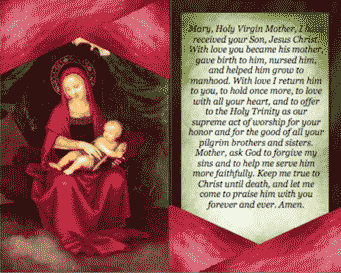 The Virgin Mary holds the infant Jesus Christ on a pink and green background. A prayer to the Mother of God is on the other side. This is great as an insert for weddings and funerals. I have received your Son, Jesus Christ. With love you became his mother, gave birth to him, nursed him, and helped him grow to manhood. for your honor and for the good of all your pilgrim brothers and sisters. Mother, ask God to forgive my sins and to help me serve him more faithfully. Keep me true to Christ until death, and let me come to praise him with you forever and ever.